LOCALS TIP: Gorman happens to be the most expensive gasoline on the mountain. Head North one more exit to Frazier exit and get fuel for .10 to .30 cents cheaper. Really! Bikes, beer & boys sums up Hungry Valley in Gorman California, located up the Grapevine; Interstate 5 corridor that runs over the 4144' Tejon Pass, connecting SoCal to the Central Valley. The big attraction here is the annual wildflowers, the OHV Park, Hungry Valley or many just call it Gorman. Los Padres National Forest next door is prime for primitive campsites, plus hike, bike & off-road trails. 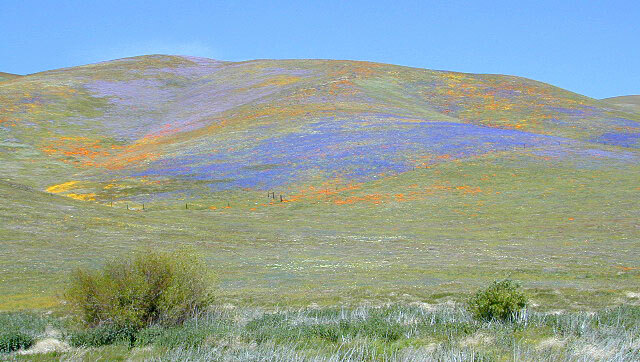 California golden poppies & purple lupine blanket the surrounding hillsides each spring. Make sure to pull off the freeway to view or photograph the spectacular colors! Most people know Gorman for poppies, or as a food & gas stop along the Interstate. The historic Ridge Route connected Los Angeles to the San Joaquin Valley back at the turn of the century. Gorman California was along this route & now the modern freeway replaces the old road. Portions of it can still be toured by high clearance vehicle - in the backcountry of Angeles National Forest, on the east side of I-5.